Why the quality of poultry syringes for mass vaccination matters a great deal! 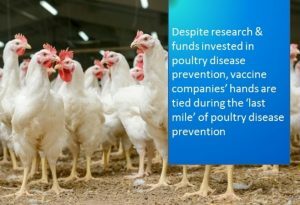 Despite research and funds invested in poultry disease prevention, vaccine companies’ hands are tied during the final stage in poultry disease prevention. The ‘last mile’ of subcutaneous poultry vaccination is the final link in a long complex journey for preventing disease. Following years of scientific research and field tests, the ‘last mile’ in the vaccination process, comes down to what we call the “quality injection factor” – the ability of the syringe and its administrator to complete the task as intended. When performed well, the ‘last mile’ not only helps to avoid poultry disease outbreaks, it becomes an important insurance measure for increasing production. However when mishandled, the safety of the entire flock is at stake. In a time of globalization and concentrated poultry production designed to meet a growing demand for protein, the stakes at this final stage are high and increasingly rising. Since faulty administration of vaccines is the most common cause of vaccine failure in poultry, the syringe is a very important link in the chain. So what can poultry growers and vaccination crews do to guarantee success? What steps need to be taken during the ‘last mile’ in the vaccination flow to meet the vaccination company’s intent? What factors should be considered when choosing a vaccination syringe? According to vaccine manufacturing giant Merial, “proper vaccination planning and administration improves disease control and the financial success of a commercial poultry operation”. However many of the vaccines produced are fragile products. All of them have a finite life and their administration is influenced by the quality of the syringe as well as the way they are handled. The syringe’s quality often depends on the materials it’s made from, its precision and durability. All these factors can influence the vaccine’s effectiveness and therefore the bird’s level of immunity. The trouble is that there is little that vaccination companies can do to guarantee a safe passage to final vaccination. Why so much rides on the quality of the syringe? Today the quality, efficacy and design of poultry syringes play an important part in the success of labor intensive vaccination processes. To function repetitively and avoid wastage, vaccine syringes must be made from quality long-lasting materials such as stainless steel and tempered glass that don’t affect the substance. They must be fit for automatic processes, easily maintained and easily disinfected. They need to meet ultra-precise measurements in different doses for oil and water-based vaccines. They must also be designed ergonomically for comfort and meet all the demands of repetitive use. 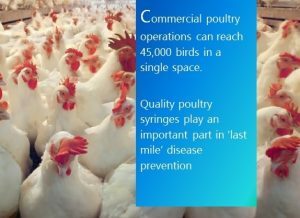 As a syringes manufacturer, ThaMa-Vet urges the poultry community to focus on reliable syringe equipment that can last the distance, that is; syringes that can efficiently deliver the right dosage the right way and help to successfully complete the ‘last mile’ in disease prevention.